The art of embroidery on net is a very old technique. 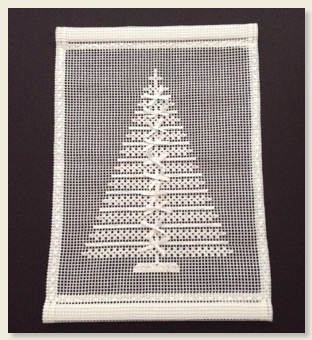 We will create a Christmas Tree wall hanging using darning net, cotton thread and Offray ribbon. All materials needed to make this unique wall hanging are in the kit along with the instructions. Design Area: 11" x 15"
Kit Contents: Lace net, thread, ribbon, needle, slats for hanging, instructions. If you want to wear something “glitzy”, this is the project for you. The bracelet is done with seed beads and two rows of Swarovski round crystals. The bracelet is secured by magnets so it is easy to put on. 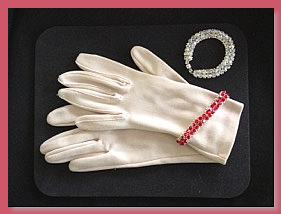 The student will have a choice between a red or crystal bracelet. Kit Contents: Seed beads, Swarovski round crystals, thread, beading needle, magnets and instructions. Student Provides: If you have one, your favorite beading needle; light and/or magnifier; and scissors. Line a box, make a pin cushion, needle holder and fob for your scissors. 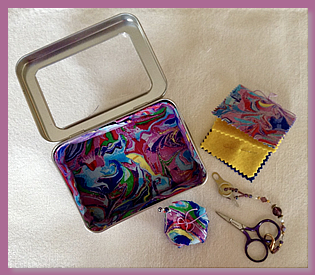 Kit Contents: Box, material, thread, beads, scissors, needle and instructions. Student Provides: Scissors for cutting material, light and/or magnification, if needed. INTERMEDIATE: Knowledge of basic stitches, materials and their use in the technique being taught is required. ADVANCED: Ability to execute simple and difficult stitches in the technique is required. The student should also have some knowledge of color design that will allow exploration and creativity. Copyright © Seminar 2019 Committee of the South Central Region of The Embroiderers' Guild of America, Inc.